Autumn Oaks Memorial Park is located just south of Interstate 10 and west of Highway 62 in the McLewis community of Orange on Old Highway 90. 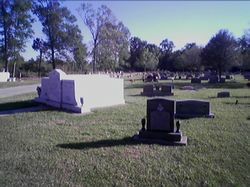 Autumn Oaks Cemetery is among one of the most beautiful perpetual cemeteries in Southeast Texas and has many options available for the final disposition of your loved one. Autumn Oaks holds the ability to provide services for traditional burial or entombment in the recently completed granite mausoleum. Should you choose cremation, Autumn Oaks can also have a burial or placement of the cremated remains in a niche or mausoleum. Please note as of September 25, 2018 Autumn Oaks Memorial Park is under new management and ownership. Many people in Orange and the surrounding area have chosen Autumn Oaks Memorial Park to honor their loved ones, because of its beauty and sense of peace that is felt by the grounds, and beautiful features offered at Autumn Oaks. Should you need further information, please contact the office at (409) 423-0139.